I was parked off the Monache Jeep Trail about a mile from the pavement, having spent the night comfortably sleeping in my van. I was there to do a hike into Monache Meadows to climb Monache Mtn, a P1K overlooking the meadows. 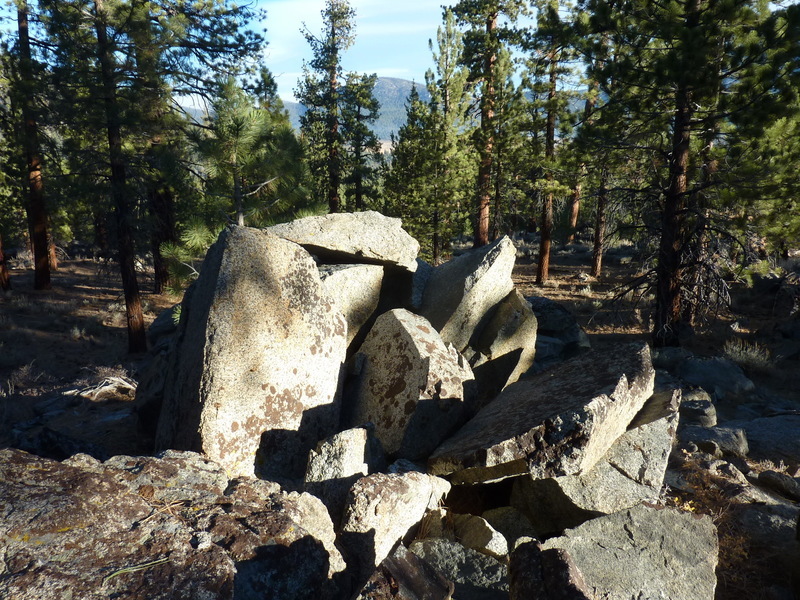 With a sturdy 4WD vehicle and sufficiently high clearance one can drive to the foot of the mountain in this part of the Southern Sierra just south of the Golden Trout Wilderness and west of the South Sierra Wilderness. At one time the only way to reach the area was on foot, by packtrain or in a light airplane. It appears that aircraft no longer land on the airstrip at the north end of the meadow now that the Monache Jeep Trail has made it accessible by overland vehicles. In late summer and fall the area becomes very popular with the OHV folks who come here to hunt, drink, relax, and explore, sometimes all at the same time. The area is also used extensively to graze cattle. These are mostly gone by fall but their feces litter the vast meadows and much of the surrounding forest. It was dark at 6a when I awoke to start my day. I turned the engine on to warm up the inside before getting out of my cozy sleeping bag to dress and eat breakfast. It was 41F outside when I started just after 6:30a, not really that cold for late Oct in the Sierra at 8,000ft. The worst part of the Monache Trail is about 1/3mi from where I'd parked, a somewhat steep section of maybe 100ft with large boulders and inches of dust and dirt dug up from the various vehicles struggling on this part of the road. Beyond this the road grows more tame, eventually coming out to the meadows where a bridge crosses Snake Creek. It took me about 40min to reach this point just as the sun was rising over the meadows to the east. The road continues east and then north over a saddle on Summers Ridge. I didn't realize this until after I had already done some minor bushwhacking and cross-country travel up Summers Ridge, eventually spying the road and returning to it. At the saddle where the road drops down into Round Mountain Stringer (a creek drainage and meadow between Summers Ridge and Monache Mtn), I left the road to make the easy excursion cross-country for a bonus peak, the highpoint of Summers Ridge, a non-descript collection of rocks found at the flattish summit with no views to speak of. It did offer some partial views of Monache Mtn and the SE Slope I would be ascending, reassuring me that there was no serious brush to contend with. I dropped off Summers Ridge in a direct line for Monache Mtn, just across the meadow found between the two. A pair of hunters had just gotten out of their truck and started across the meadow, rifles in hand. They had their back to me as I made my way across, downstream about 100yds, imagining myself a deer and wondering if I'd get across and into the safety of the woods before being spotted. They seemed engaged in conversation and not really looking around. I don't think they knew I was there. As hoped, the cross-country travel up Monache wasn't bad. There was some brush, but it could be avoided by careful choice of route. It was after 9a by the time I had topped out. The highpoint seems to be in a small thicket of brush but someone had piled a large cairn just outside it. Next to this were the remains of a glass jar that probably served as a register at one time. Though it sports more than 1,000ft of prominence, the views were minimal due to the surrounding trees. It appears someone had done some practice cutting near the summit, chopping a bunch of smallish trees, leaving them on the ground where they fell. It wasn't clear that there was any purpose to the cutting other than to watch the trees fall. People are funny that way. It was still quite early in the morning and it seemed I would have plenty of time to extend my excursion to Brown Mtn, just under four miles further north. It would make the day well over 20mi, but what else was I going to do with the day? Brown is just under 10,000ft and just under a P1K, one of those "almost" summits. Since I've been tackling everything over 900ft of prominence it had been on my radar and seemed a worthy objective, plus it would give me a chance to explore a greater part of the Monache Meadows area. Descending the north side of Monache Mtn is a breeze with almost no brush and a modest but uniform forest cover. This is the route Jenkins describes in her book, Exploring the Southern Sierra in two volumes, the most authoritative source for this vast region (if you are considering buying them, make sure they include the large fold out maps in the sleeve of the back covers - without them, the books are of considerably less help, imo). Near the bottom of Monache Mtn I could see a collection of buildings through the woods to the west. The topo map has this as the Monache Ranger Station but I didn't cross the gap to investigate. Instead I came out on the meadow with a few lines of barbed-wire fences between me and where I wanted to go. I eventually found my way around or over these, then across Soda Creek where I picked up a dirt road. At this time of year travel across the extensive meadows is fairly easy with the ground mostly dry except for the areas immediately around the trickling creeks. In Spring and Summer these meadows are probably not only a lush green but a swampy mess as well. I was happy not to have to take my boots off the entire day though I criss-crossed the meadows a great deal. I followed the road heading north past a junction to the South Fork of the Kern River. Little more than a creek now, it was not difficult to find a well-placed rock to help me across. Having left the road again, I was now heading cross-country upslope towards Brown Mtn, still two miles distance. Most of this was pretty tame up until the last half mile where I had 1,000ft of gain up steep slopes, sometimes a bit brushy on the south-facing slope. I found my way to the top by 11:30a, this time with good, open views, at least in two directions. To the northwest rose the higher Kern Peak while to the south was spread out a panoramic view of Monache Meadows. Through the trees one can just see Olancha Peak to the east. I found no register or benchmark at the rocky outcrop that forms the highpoint, just a few ancient, rusting tins left from someone's lunch. Jenkins describes a route to Brown from the east starting from a saddle on the Strawberry Trail and it was in this direction that I decided to descend. As on Monache Mtn, it was a better route with little brush and easier travel. The only downside was that the route isn't very direct and requires some extra mileage compared to the straight shot I took between Monache and Brown Mtns. The Strawberry Trail (connecting Strawberry Meadow to the north with Monache Meadows to the south) is not well-traveled and not very clearly defined. Pine needles cover much of the trail but the slightly sunken tread makes it not too hard follow (plus it basically just follows the drainage down from the saddle). The trail eventually veers southeast to Olivas Cow Camp. A building and environs are signed for the USFS, locked up for the season (or possibly semi-permanently). The corral seems to be in poor shape and I don't imagine the place gets much use anymore. Somewhere the trail continues SE past this building but it doesn't really go in the direction I wanted. I could see Monache Meadow past the corral and Monache Mtn beyond where I needed to return, so I set off cross-country once more, this time over easy meadow terrain. My route took me past a set of 5 or 6 green cabins that were once the Monache Meadow Lodge. After a series of private owners, it was bought in the 1990s by the Trust for Public Land, to hold until the Forest Service could buy it. These, too, were locked up in suspended animation until someone could figure out what to do with them. Walking into the meadow beyond the cabins I found a great deal of spent shells, broken clay pigeons and iron works set up for target practice. The place seems to have a long history of folks shooting off the back porch while waiting for the steaks on the BBQ to be ready. In my walk across Monache Meadow I came upon more fencing to skirt around, eventually landing on a road near the unused airstrip (this is not a paved runway, but rather just a large flat area of hard ground, not exactly the stuff that makes for a smooth landing). Through a gate, past a junction or two, another crossing of the South Fork Kern River, more meadow and finally the edge of the forest on the east side of Monache Mtn. There were a few vehicles parked in the forest at open campsites. One of these was occupied by two gentlemen I visited briefly. They had several vehicles, cots, coolers, BBQ and a host of other camping amenities to make life comfortable. There was a rather large pile of empty beer cans and bottles in the middle, a nearly empty 1.75L bottle of whiskey sitting on a stump nearby. "Looks like you guys are here for the long haul," I offered. Turns out they had only been there three days. They had two companions out on a hike, but even with four of them the amount of alcohol consumed seemed staggering. They were very polite and asked if they could offer me anything but I declined. Only after I had left did it occur to me that they probably had more cold beer on ice and that it would have been a mighty fine treat just then. Sometimes I can be very stupid. They gave me directions to finding the Monache Jeep Trail through the woods and I was soon back on it. I had another hour and a half of hiking to get back to the van but was hoping I might get lucky and catch a ride with someone on their way out. I did have several vehicles pass me in the opposite direction but unfortunately none heading my way. Even so, it was only 3p by the time I returned. It seemed a bit too early to call it a day with more than three hours of daylight remaining, but having walked some 22mi I was also getting tired. I decided to drive out to the Blackrock TH about 10mi away to make the short climb to Blackrock Mtn.